Colorful and delicious bean-patch salad. In large bowl, whisk together dressing ingredients. Add beans, peas, corn and bell peppers. 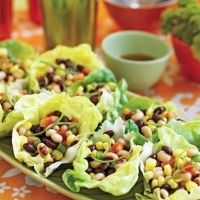 Place lettuce cups on serving platter; spoon bean mixture into lettuce cups. Great recipe, that's frugal which is a good thing for families. A very really nice sounding recipe. Like essence_magazine's recipes? Never miss an upload!